Jeff’s Plumbing provides plumbing services and retail sales. They sell plumbing fixtures, faucets, water heaters, garbage disposals, and plumbing repairs, pipes, and fittings. They do new construction, remodel, and repair, including septic systems, water and gas service lines. 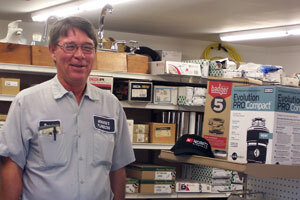 What started as Howard’s Plumbing in 1974, has now changed to Jeff’s Plumbing with Dennis Howard’s retirement. They serve Greeley and Wichita counties.